Photos and text by Donna DeSousa. If ever there was a hummingbird groupie, it would be me. Obsessive research concerning their likes/dislikes and habits has become my modus operandi. I also love photographing them. I have included this photo because it is funny, it was taken in Las Vegas in the middle of a huge resort. I found solace away from the hubbub of Vegas by watching this molting bird. I've learned which plants and habitats they are drawn to and I include this information here to help educate friends, family, and strangers alike. 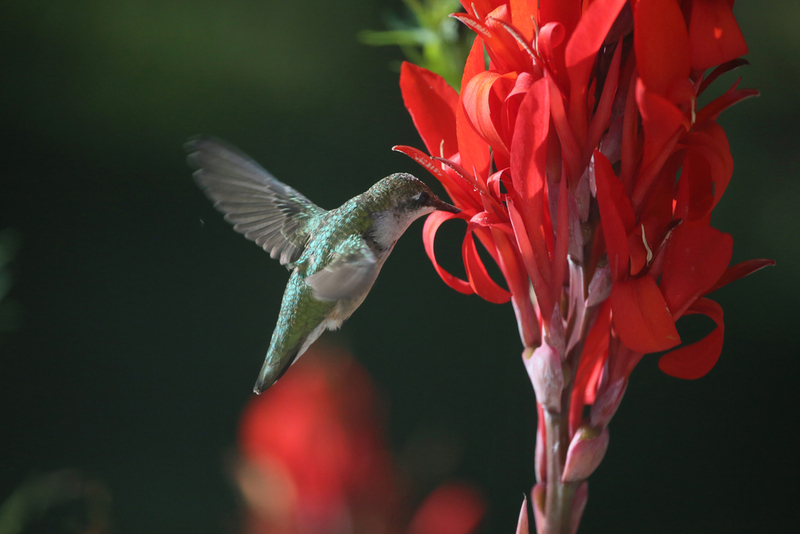 It is my hope that we all consider how our landscaping choices and activities impact the environment, not just for hummingbirds but for all birds, animals, beneficial insects, and the very earth that all lifeforms need to survive. The Ruby-throated Hummingbird is the only species found on Long Island and throughout much of the Northeast*. The personalities of these tiny pollinators are fierce for their size and I find them to be irresistible. Since I live in the suburbs of NYC, its especially exciting to see them here in my own backyard. Not surpisingly, many people have never seen one locally and it's been my mini crusade to change that. When we moved to a new home in Greenlawn, it was love at first sight when I saw it had a wonderful arbor of two massive, intertwining Trumpet Vines over the front walkway. 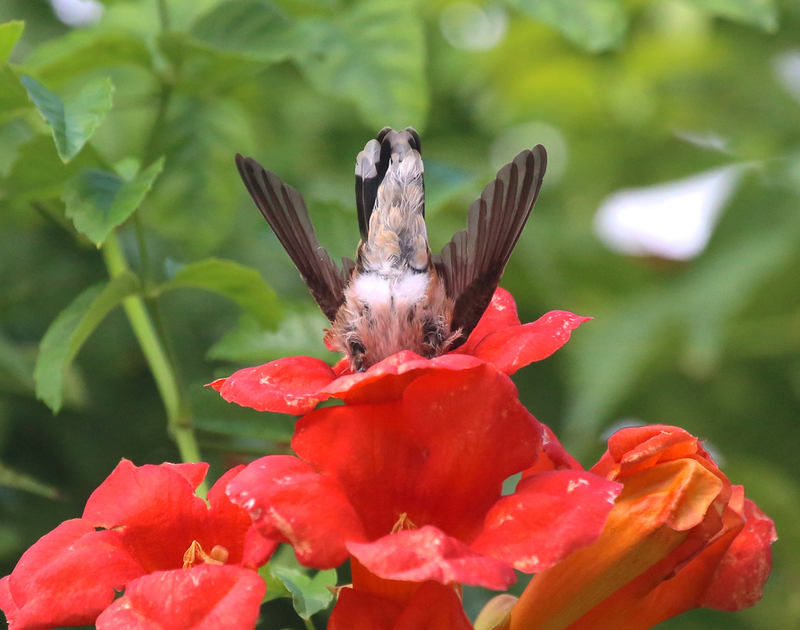 Trumpet Vines, though invasive, are hummingbird magnets. It was on that Trumpet Vine that I saw my very first hummingbird on Long Island. Since that sighting, I have expanded our hummingbird garden every year by adding more feeders, flowers, water sources, and better habitat which has translated to our home hosting greater numbers of birds every year. 2015 was the first year I had two males vying for mates. I witnessed their flying dance in front of some of the females which was an amazing sight. They fly in a large pendulum shaped arc at high speeds to show off their gorget (the red coloring on the neck which only males of this species have) and make interesting clicking noises as they fly. Their aerial antics must have worked because there were visible nest marks on the females, which was a telltale sign they were nesting nearby. While I haven't found a nest yet, it is on my bucket list to do so. This may end up being impossible as they are really, really TINY and very well camouflaged. Think golfball size, covered in lichens and moss to match its surroundings. I should note here that I have based my own hummingbird garden loosely on the stunningingly beautiful The Baiting Hollow Hummingbird Sanctuary owned by Dr. Paul Adams. It is a 3.5 acre plot of land dotted with two small, rustic and charming cabins, located on the bluffs overlooking the Long Island Sound. Mr. Adams has graciously invited visitors to his spectacular property during the month of August where multiple hummingbird sightings are almost guaranteed. He has created this magical place for hummingbirds and humans alike. Sadly, his neighbors are unhappy with the visitors that come and have filed suit against him. I volunteered to start a "Friends of the Baiting Hollow Hummingbird Sanctuary" facebook page to help gather support for Paul in his fight against the Town of Riverhead and his neighbors. The lawsuit is still ongoing. Here are just some of the reasons why I love them and find them fascinating! The Ruby-throated Hummingbird beats its wings about 53 times a second, its heart beats up to an amazing 1260 beats per minute. Because of their tiny size, they resemble large bees. Many people have been fooled. Their total length is about 3 1/2 inches from tip of bill to tip of tail, with females being slightly larger than males. That's about the same size as my middle finger! 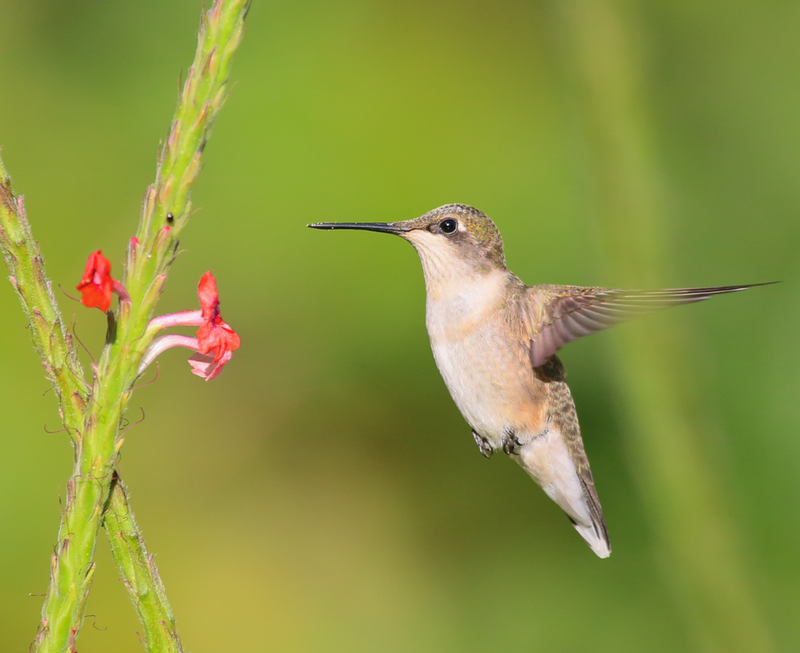 Ruby-throated Hummingbirds only weigh on average 3-4 grams, while a nickel weighs about 4.5 grams, that's crazy small! 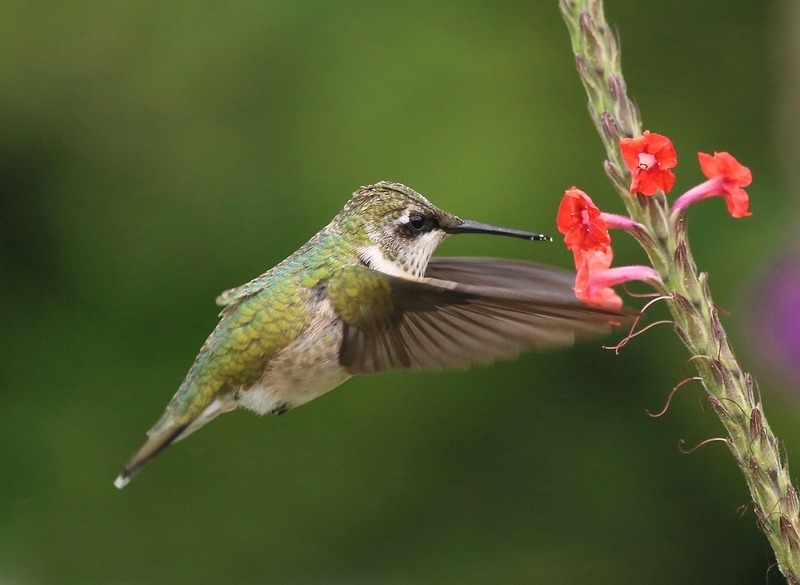 Like all hummingbirds, Ruby-throats are precision flyers with the ability to fly full out and stop in an instant, hang motionless in midair, and adjust their position up, down, sideways, and backwards with extreme control. They dart between nectar sources with fast, straight flights or sit on a small twig keeping a lookout, bill waving back and forth as the bird looks for intruders. Hummingbirds are very territorial. 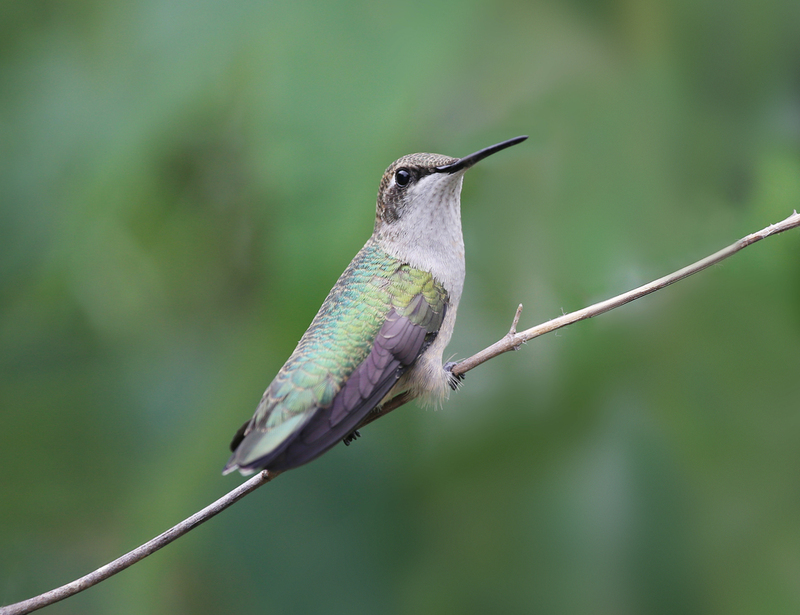 The extremely short legs of the Ruby-throated Hummingbird prevent it from walking or hopping. Like many birds, hummingbirds have good color vision and can see into the ultraviolet spectrum, which we cannot. When hummingbirds sleep, they go into a hibernation-like state called torpor. This is a really deep sleep. Their metabolism slows, their body temperature lowers, and their heart rate drops to about 50 beats per minute. Their breathing slows to the point that it may appear they have stopped breathing. By sleeping like this, hummingbirds can save up to 60% of their available energy. Ruby-throated Hummingbirds are eastern North America’s only breeding hummingbird. Every year, they fly north in the Spring to establish their breeding territories up and down the east coast into Canada and the mid west. Then they fly back down to Central America to spend the winter. In terms of area, this species occupies the largest breeding range of any North American hummingbird. Hummingbirds are known to be site specific, meaning they return to the same areas for nesting and in their wintering grounds. Making your yard attractive to them will help increase their visits to your home and could encourage them to breed and nest nearby. Females do all the work of building nests and raising young. Nests are the size of a golf ball, 2 eggs the size of tic tacs are laid in it. Ruby-throated Hummingbirds migrate twice a year. Their journey involves traveling up to 3,000 miles one way making stops along the way for refueling. It is thought they fly at tree top level, so they can scope out possible nectar sources. They make their way north in late winter/early spring and south in late summer/early fall. Those that visit our area sometimes travel over the Gulf of Mexico during their migration to reach the Yucatan Peninsula. That equals a non-stop flight of up to 500 miles! Oil tankers in the Gulf sometimes keep feeders onboard to help these little birds refuel where they might otherwise perish. In anticipation of migration, hummingbirds almost double their body weight and put on extra fat. As you can imagine, the extra weight is burned off while in transit. If you'd like to learn more and are still curious like me, visit this link to learn more about their migration. For additional interesting information and to learn more, please visit Operation RubyThroat. 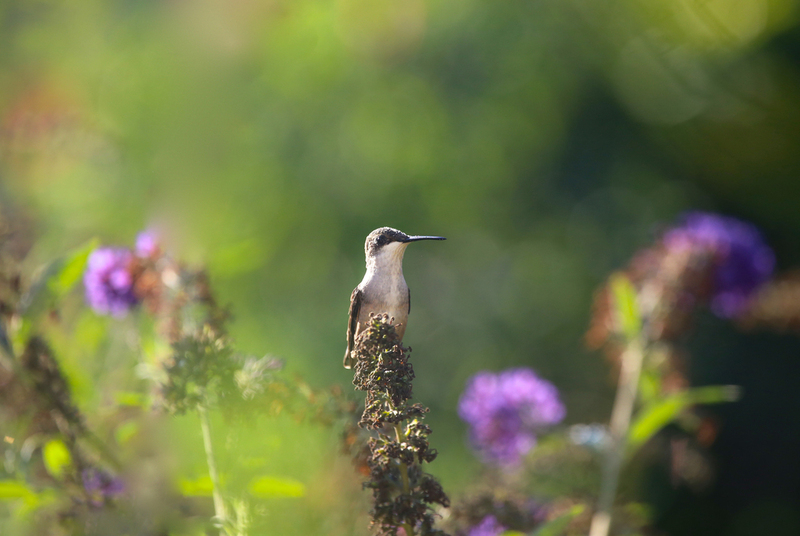 *Occasionally there are migrant species such as Rufous, Calliope and other hummingbirds who make an appearance in the territory that Rubys occupy in summer. It is considered a rarity and generally happens in the winter months. I did have the unique opportunity to see a female Rufous using a feeder in Port Jefferson, Long Island during the winter months of 2012. The woman hosting her worked very hard to provide food for this little bird, despite freezing, winter temperatures. Unfortunately, it is unclear whether this bird survived as she wasn't seen again after the area got hit with a blizzard. December 10, 2015: A female Rufous or Allens (it's extremely difficult to tell them apart) is currently being hosted by the Baiting Hollow Hummingbird Sanctuary. I am thankful for the warm December we've had so far and I bet she is too. January 20, 2016: Sadly, the Rufous female the Baiting Hollow Hummingbird Sanctuary was hosting, disappeared after a huge winter storm blew through. This despite a handful of volunteers working daily to help LaLa, as she came to be called. The volunteers tried everything in their power to help her, including hanging heat lamps and heated feeders but it wasn't enough. Had the storm not hit, I am confident she might still be around.